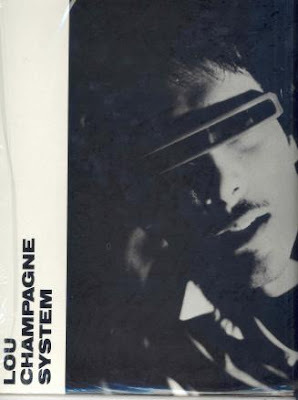 Popular in the Mid 80's TO club scene and University Campus Radio across Canada, the Lou Champagne System was a big hit in Europe, particularly Germany. Lou is a one man guitar synthesizer solo act that plays dark, heavy, original electronic rock. Lou is an electronic wiz and designed and built a lot of his gear himself. When Lou performs solo he operates switches and pedals on the floor while playing some keyboards and his guitar and it sounds like a whole band. Lou also plays with Wild Abandon (Russ Watson and Tony Wachnuick) and The Scientists (Brian Docherty and Tony Wachnuick) most lately in the Hamilton area. Recently, there has been a resurgence of interest in his music and sales of 'No Visible Means' have started overseas again thanks to some devoted fans and the inclusion in 'Reminscent' a German compilation of popular 80s indie synth bands. another crown jewel of the early 80s minimal synth scene! Note: link removed as this is now being officially reissued by Medical Records. That description of Lou sounds a LOT like Nash the Slash, except that Nash played electric violin and mandolin, along with effects/electronics. I believe Nash the Slash was from Toronto. Thank you so much for everything you have posted. A request: If you have it, can you please post the "Sperm" LP - "Shh!". I missed it at Ezhevika Fields, its on the NWW list (as I'm sure you already know). Thank you again for sharing all this great avant-garde music.